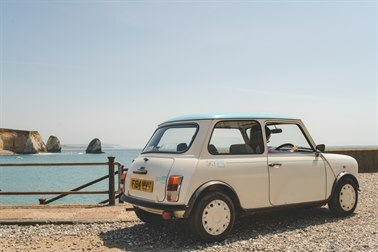 Living on the mainland, but with a family holiday home on the Isle of Wight, Charlie loves visiting the Island and having adventures in his classic MINI - always with camera in hand. You can follow his adventures below or on his YouTube Channel. 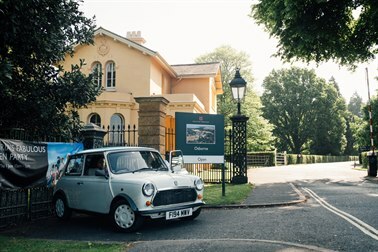 9:00 - Arrive East Cowes, home of Osborne House – the Island’s own Royal Palace, follow the A3021 to Newport, the Island’s ‘capital’, then follow the A3054, before turning off onto Coleman’s Lane. Follow the lane and signs for Newtown Nature Reserve. 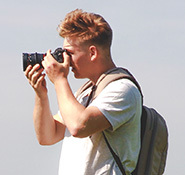 9:45 - Newtown Nature Reserve - walk and explore this beautiful Nature Reserve and estuary. Make sure you visit their iconic bird hide which is accessed via a wooden footbridge over the marshland. 11:00 - Re-join the A3054 and drive to the historic town of Yarmouth. Here you can visit Yarmouth Castle built in 1547 by Henry VIII – open daily from 10am-4pm. Then take a walk on Yarmouth Pier - the only wooden pier of its type in the UK, which was built in 1876. 12:00 - Take the A3054 to Totland before heading along the B3322 out to The Needles - the iconic chalk stack that once many millions of years ago joined the Isle of Wight with the mainland. There are amazing views from here – make sure you take the chairlift down to the beach, where you can grab a tripper boat out to go around the Needles or collect the coloured sand from Alum Bay beach. 13:00 - Head away from the Needles and pick up the A3055 – known here as the Military Road. This is the longest straightest road on the Island and got its name from being built as part of the Island’s defence network in 1860. 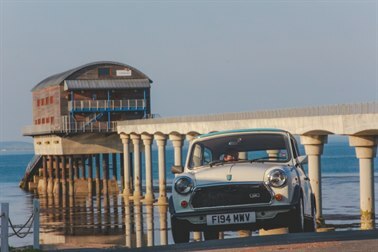 Drive through picturesque Freshwater Bay (once home to Alfred, Lord Tennyson) and through past the Jurassic heritage coastline beaches of Compton (a must stop for a quick ice cream from the local van), past Brook and the many chines that lead down to the beaches. 13:45 - Arrive at The Buddle Inn, Niton for lunch. This award winning character pub has amazing views out over the sea and also serves some seriously great pub food. 15:00 - Head down the road from the Buddle Inn to St Catherine’s Lighthouse. This is still an active landmark for passing ships and is run by Trinity House, who have tours daily from 1300 – 1630. 16:00 - Pick up the A3055 to Niton and follow the Whitwell Road through to Ventnor & Shanklin, and on through to Sandown and Yaverland Beach. This is one of the Island best spots for finding fossils and there are guided walks led by palaeontologists throughout the year. 17:30 - Pop along the coast on the way to Bembridge and take a diversion off across the National Trust down land out to the Culver Haven monument and stop for a quick pit stop at the Culver Haven Inn. There are some staggering views here out across the Island. N.B This was where Google Maps failed and took our Mini Adventurers on some very narrow green lanes. 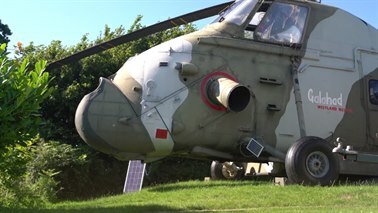 18:30 - Pick up the B3395 and drive through to RNLI Bembridge Lifeboat Station. There are also some fab beaches and small eateries dotted around Bembridge that are well worth a visit if you’ve time. 19:00 - Drive through St. Helen’s and head to Appley beach. 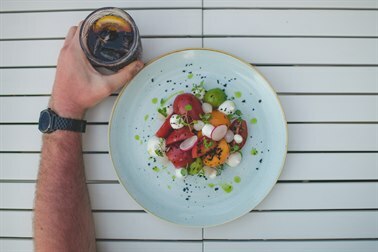 Stop for some amazing food and cocktails at Three Buoys restaurant with great views over the Solent. 21:00 - Pick up the A3054 back through to East Cowes and your Red Funnel ferry home. 11am – Arrive East Cowes, and take the A3021 towards Newport. At the big roundabout take the A3054 left towards Ryde and then take the first right down Park Road, go straight across the mini roundabout and carry on along Briddlesford Road. Turn left down Combley Road following the signs for Havenstreet. Leave Havenstreet and continue on the road towards Ashey. Go straight across the next two mini roundabouts and follow Smallbrook Lane turning right at the end. At the lights turn right along the A3055 and at the roundabout turn left past Tesco’s to Wight Karting. 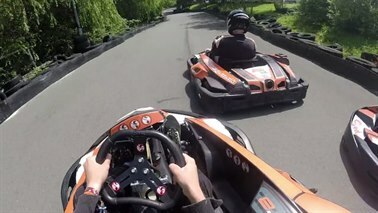 11.30am – Arrive at Wight Karting and get suited up for go-karting action and lunch. 1pm – Head back the way you came and turn right onto Briddlesford Road. Take the first left down Blacklands Lane and at the end turn left down Staplers Road into Newport. Head through the middle of Newport on the B3323, through Carisbrooke and on towards Freshwater along the Middle Road all the way to Freshwater Bay. 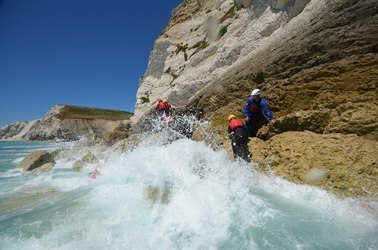 2-4pm- Arrive at Freshwater Bay car park andmeet up with Adventure Activities Isle of Wight to get kitted up to go coasteering around the natural cliffs and caves in the bay. 4.30pm – Head back along the Middle Road to Carisbrooke. Follow signs for Carisbrooke Castle, turning right off the B3323 and at the next mini roundabout go straight over instead of turning into the castle. Follow the road round and take your first right down Froglands Lane (signposted The Cowshed). Windmill Campersite is on the left accessed through The Cowshed farm. 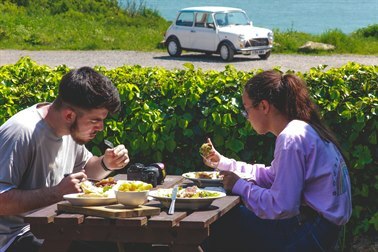 Get yourself settled in this quirky super cool glamping site and ready for supper. 6pm– Head back towards Freshwater along the Middle Road turning left into Tapnell Farm and The Cow Co restaurant before you reach Freshwater. It’s really well signposted from the road. 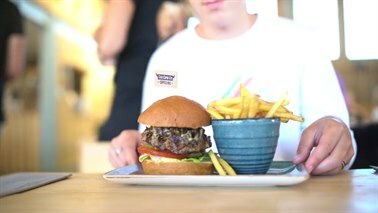 Enjoy some fabulous cow inspired dishes including a super burger at The Cow Co.
8pm – Make your way back along the Middle Road to Windmill Campersite to chill out infront of the fire. 8.30am – Make your way across the Island back through Havenstreet and on past Smallbrookturning right at the end of Smallbrook Lane. At the lights go straight over and follow the road down and round to the left until you turn right on Pondwell Hill. Now follow the road through Nettlestone and into St Helens and The Duver. 9.30am – Arrive at Tackt-Isle St Helen’s for land wind surfing and Segway fun. 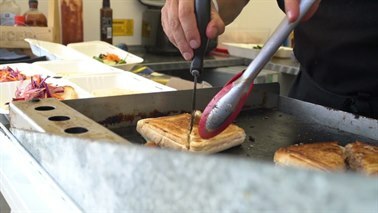 12noon- Head round the corner from Tackt-Isle for a spot of street food style lunch at The Ralvins, The Duver. 1.30pm – From The Duver drive along Carpenters Road towards Brading. Turn left along the A3055 and drive past Sandown and on into Lake. Turn right ontothe A3056 and at the roundabout turn left into Whitecross Lane and right into Isle Jump. 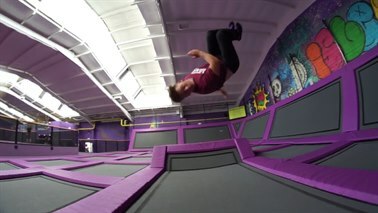 2pm – Enjoy some energetic trampolining and dodge ball at Isle Jump, the Isle of Wight's indoor family trampoline attraction, with 40 trampolines, dodgeball, basketball and a foam pit. 4pm – Rejoin the A3056 towards Newport. Stay on the road until Arreton. Turn right onto Downend Road and drive past Robin Hill and continue straight on over the mini roundabout, along Briddlesford Road until the next mini roundabout. Head straight over along Park Road and then turn left onto Lushington Hill before taking the second exit from the roundabout signposted East Cowes. Take the 3rd left down Folly Lane and continue until you reach the Medina River. 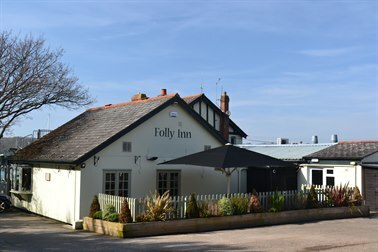 5.00pm – Relax overlooking the river and enjoy a great pub supper at the Folly Inn. 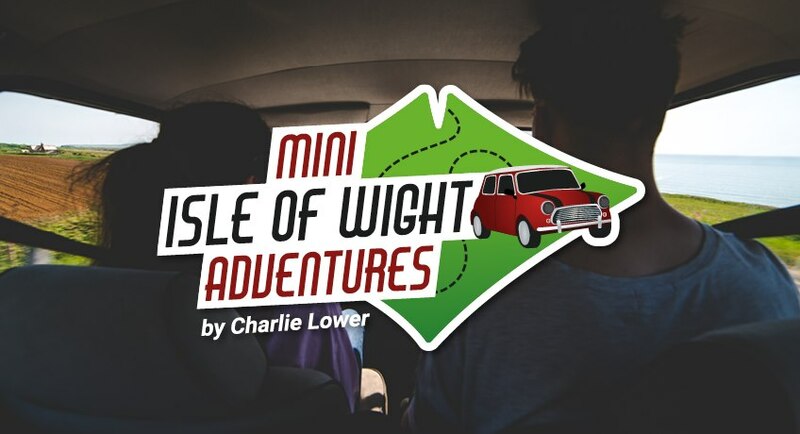 6.30pm – Rejoin the A3021 for the short drive down into East Cowes and the ferry home. 9am – Arrive East Cowes, and take the A3021 towards Newport. At the big roundabout take the A3054 left to Ryde. Once in Ryde make your way along the Esplanade and take the left just before Waterside Pool along N Walk on the beach’s edge (a one way street) until you reach Three Buoys Restaurant on the corner. Drive up and park in the council car park behind the restaurant and make your way across into Appley Park. 10am – Arrive at Goodleaf Treeclimbing and get kitted up ready for some high rope adventure. 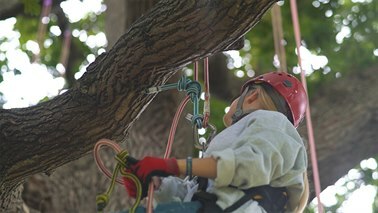 Experienced Goodleaf staff will show you the ropes so that you can safely scale the heights of the 70 foot oak tree. Once you’re in the canopy, you can enjoy beautiful sea views, relax in the special tree top hammocks or challenge yourself to climb as much as you want to. 12.30pm – Head back the way you came along the A3054 towards Newport and just before the roundabout that takes you to East Cowes and the ferry, turn left down Park Road, go straight across the mini roundabout and carry on along Briddlesford Road. 1pm- Turn right intoBluebells Café at Briddlesford Lodge Farm and stop for lunch and to see the calves. 2.30pm – Turn right back onto Briddlesford Road and at the mini roundabout take the first left down Staplers Road to Newport. Head through the middle of Newport on the B3323, through Carisbrooke and on towards Freshwater along the Middle Road. 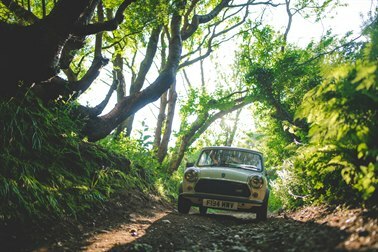 Turn left into Tapnell Farm where both Top Targets and Adventure Activities Isle of Wight are located. It’s really well signposted from the road. Spend the afternoon learning some new skills like clay pigeon shooting, axe throwing and mountain boarding. 6pm– Head back along the Middle Road towards Newport. At Calbourne turn left along Elm Lane until you reach the T junction with the A3054. Turn right and follow the road towards Newport. At Newport follow signs to West Cowes along the A3020. Once in Cowes follow signs for The Parade. 7pm – Arrive at The Yachtsman, located on The Parade with a terrace and some great views overlooking the Solent. 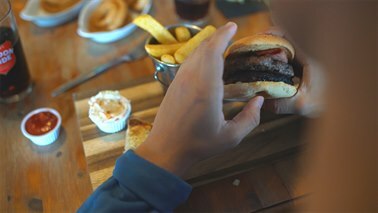 Enjoy some pub grub, and some live music (available on Fridays, Saturdays and Sundays). 8.30pm – Make your way backto Newport and out along the A3054 towards Ryde, turn left down the A3021 into East Cowes and the ferry home. 10am - Arrive East Cowes, and take the A3021 to Newport. 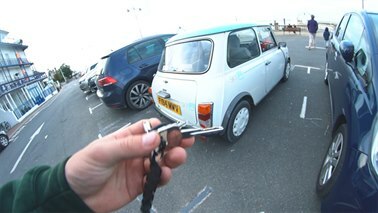 As you pull onto the dual carriageway through Newport (the Island’s only dual carriageway! ), take the first exit into town. Take the first left off the mini roundabout and left again down Sea Street. Park opposite Quay Arts in the public car park. 10.15am - Brunch at Quay Arts, Newport. After brunch, stay and enjoy the art gallery and shop selling jewellery and crafts by local artists. 11.30am - Rejoin the dual carriageway and follow signs for Yarmouth along the A3054 and then on through Freshwater. 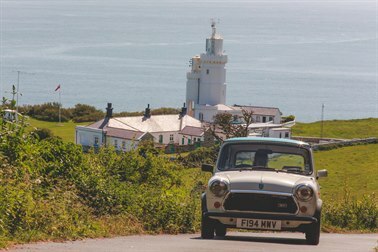 Continue along the B3322 through Totland and on to The Needles at the Island’s most westerly point. 12noon - Arrive at The Needles Landmark Attraction. Park in the car park and go and explore the shops and activities – making sure you go to the sand shop to fill a glass bottle with the Isle of Wight’s renowned coloured sand. Take the chairlift down to beach and take the Needles Pleasure Cruises tripper boat out to The Needles to get an up close and personal look at the famous chalk stacks. 1.45pm - Head back to Yarmouth along the B3322 and A3054. Once you cross the bridge into Yarmouth turn right down Victoria Road and park at the end. 2pm - Lunch at Off the Rails, Yarmouth. 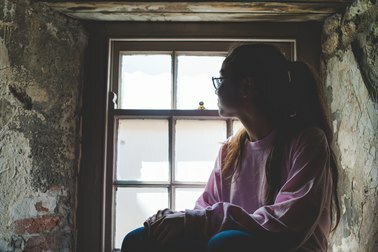 This beautifully converted Victorian train station is ideally located to take in the stunning views of the western Yar and serves a fantastic menu – try the The Luggage Burger (I.O.W beef, sesame charcoal bun smoked bacon, melted Cheddar house mayonnaise, ketchup, slaw crisp lettuce, tomato & pink onions), the Flying Scotsman (roasted fig, toasted ciabatta, beetroot pickle, spiced honey glaze, I.O.W blue cheese & maple walnuts) or The Yardmaster (Yarmouth crab linguine, lobster bisque cream, herbs, lemon & garlic breadcrumb). 3pm - Drive back onto the A3054 and as you leave Yarmouth turn right down the B3041, Thorley Road. Take your first left (this stays the B3041) onto Main Road and carry on along until you reach Wellow and West Wight Alpacas and Llamas, on your right. 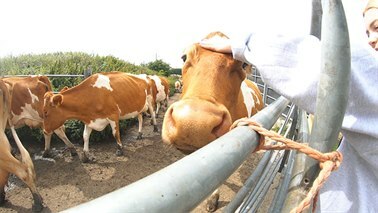 3.15pm - Arrive at West Wight Alpacas and Llamas and meet all the animals & take them for a walk around the farm. 5pm - Carry on along the B3401 and turn left at the T junction onto Station Road and then right at the next T junction, re-joining the A3054 towards Newport. After approx. 5 miles turn left down Whitehouse Road and continue to the end. Turn right and follow the road round until you come to a mini roundabout. Take the first exit down Rew Street, signposted Gurnard. Follow this road and you will come to the sea and over a small bridge. The Little Gloster is located on your left. 6pm - Arrive at The Little Gloster for supper, romantic sundowners and luxurious B&B accommodation with stunning sea views. 10.15am - Turn left out of the Little Gloster and take the first right up Cockleton lane until it joins the A3020 Newport Road. Head into Newport and down the dual carriageway taking the Ryde exit lane onto the A3054 Fairlee Road. At the big roundabout continue straight over towards Ryde and then take the first right down Park Road. Go straight across the mini roundabout and carry on along Briddlesford Road. Turn left down Combley Road following the signs for Havenstreet. Continue through Havenstreet and on past Smallbrook, over the mini roundabout and turn right at the end of Smallbrook Lane. At the lights go straight over and follow the road down and round to the left until you turn right on Pondwell Hill. Now follow the road through Nettlestone and into St Helens and The Duver. 11am - Arrive at Sally’s Riding at Nodes Point Holiday Park and meet the horses. Mount up and ride out along the beach at The Duver. 12.30pm - Leave The Duver and at St Helen’s turn left down the B3395 and drive through to Bembridge. Head out of Bembridge along the B3395 towards Sandown and The Bandstand restaurant which is located on Culver Parade. 1pm - Lunch at The Bandstand, right on the esplanade look over the bay in Sandown. This is a stunning piece of architecture with the original bandstand having bean cleverly updated whilst retaining the essence of its true form. 2.15pm - Head out of Sandown following signs for Lake and pick up the A3056 main road towards Newport. Turn right at Arreton onto Downend Road (follow brown signposts for Robin Hill). At the mini roundabout at Robin Hill continue straight over onto Briddlesford Road and follow until the end. At the mini roundabout turn left down Staplers Road and Monkey Haven is on your right. 3pm - Visit the Monkey Haven and make lots of new furry friends! There are talks daily about all the animals. 5pm - Head back up Staplers Road to the mini roundabout and turn left down Park Road and then at the end turn left onto the A3054. At the big roundabout take the 2nd exit to East Cowes and the Red Funnel ferry. 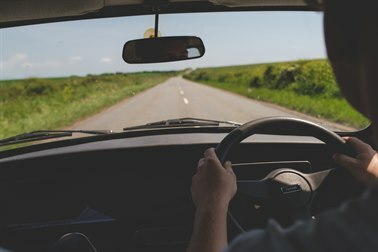 It's is a great time for trying new activities and exploring new surroundings so how about packing up the car and setting sail on your own Isle of Wight adventure.